Seeing as how I Typhooned the mvn.com/bucksdiary... for now... I cannot give proper credit to an astute commenter a few posts back whose words of warning ought to give Bucksnation a little pause. Remember my Win Trajectory post, written around Xmas or just days thereafter? In it I argued that the Bucks are on a 44 win pace this season, when you make adjustments to account for unbalanced schedule and home/road splits thus far. In the comments section, someone wrote that had I done the same calculations two years ago, the Bucks were probably I'd probably have gotten similar results. I thought the commenter was right, but I lacked the information to verify, and I certainly wasn't going to go back in time and reconstruct the first two months of the 2006-07 NBA season. Then I thought of a shortcut. I remembered that Coolstandings.com, which has a win projection system not at all like mine but normally yielding close to the same results, keeps records going back several seasons. There projection would suffice. Whoa. The commenter was eerily correct. The Bucks record two years to the date the commenter posted was 16-15, and they were on a slightly better pace. Coolstandings had them projected to win 45 games. Tip of the cap to the commenter. Of course the bad news is the Bucks won only 10 more games the rest of the season and finished 26-56. Scary. But, I think the factors that led to the collapse were by and large outside the realm of forecast... injuries devastated that team as I recall. And they may (knock, knock, knock) do the same to this team... who knows? Another key difference that I think is worth noting is the 06-07 team was powered by offense, while this season's team is most certainly powered by defense. Defense is much steadier. Nevertheless, thank the commenter's fine Milwaukee Bucks memory for a warning against early hubris. Remember I said not to be alarmed if anything strange happened at the new mvn.com/bucksdiary? Well, something strange happened. Through a simple mistake compounded by a "don't push that button" attempt to backtrack and restore the blog, I appear to have destroyed it. So, while the guys at MVN.com hopefully will restore it to what it was, I'm going to post everything back here again. Maybe they won't have any interest in restoring it. Who knows. All i wanted to do was install a statcounter. Have any of you switched over? 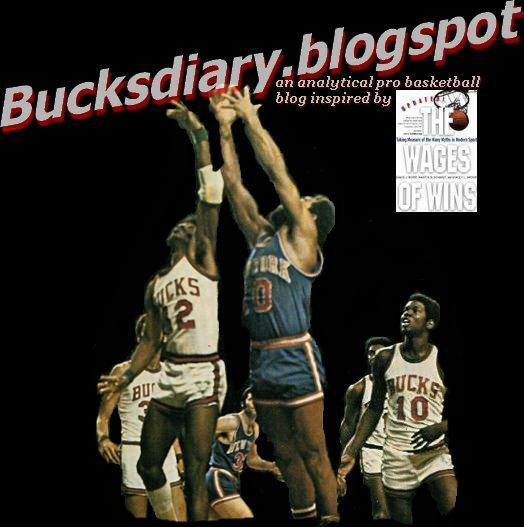 If you haven't found the new location, for Bucks Diary, its here mvn.com/bucksdiary. People are misunderstanding my argument against Michael Redd. Let me try to lay it out with odd analogies. My brother had a Saab. He paid a relatively high amount for it. When it ran, it was okay, he got some head nods from passersby, not a lot. But the damn thing never ran. He also had a Ford Focus (I'm making all this up). Didnt pay alot for it. It ran beautifully, was pretty reliable, but had absolutely no cache. Now, my brother says to himself... there's alot of suckers out there who will pay too much for my Saab, but would probably only give me market value for my Focus. Hmmm, perhaps I can sell the Saab (ie "his overvalued asset") to some sucker who would be willing to give me something more than it is worth. Gee, I would be much better off. I will have cut ties with my expensive, OVERVALUED ASSET, and gained some productive assets... assets that can help the Bucks win a Championship. That's why I want to trade Redd. I like driving him around on Friday night, but geez I can't pay through the nose for that little return. And, alot of people think Saab's are sweet, so they may be dumb enough to give me too much back (in terms of Win Production) for him. Hell, the Pistons traded one of the NBA's best Win Contributors, for like 4 seasons running, for a mediocre Win Contributor who basically volume scores and runs his mouth and I guess doesn't like to practice. So opportunites are there. Oh, one final point. Even if we only get market value back for Redd... and this is actually a HUGE POINT, he plays a position that's pretty easy to replace with a pretty decent player... so EVEN IF WE BLOW THE TRADE... no big whoop... PLUS... Redd's monster contract is off the books. Let's say there's a ton of electricians in the area and most of them are slightly below average, average, or slightly above average, with some being supertalented (Kobe) and some not so good (Ben Gordon). Meaning there is a low standard distribution (am I saying that right? I actually avoided statistics in college... i'm self taught -- like Lincoln... or, ... not like Lincoln). On the other hand, there's just slightly less plumbers in the area, but they vary wildly in talent, with few being average, many being way below average, a handful being above average and then a few being superb. Meaning there's a high standard deviation. Just play along with me, I know its dumb. Who's more valuable? A slightly above average electrician or a slightly above average plumber? The plumber, obviously, because if you lose him you risk getting stuck with something horrible. Whereas if you lose the slightly above average electrician, you can replace him with someone who can do a reasonably good job. Redd and his fellow perimeter players are the electricians. Big men and point guards are the plumbers. Why in the world would you offer a slightly above average electrician a maximum contract? Yeah, he'll do a nice job, but your distribution of resources is f%%d. I'm here and I'm there!! Everything in life is relative, idn't it? Were those the Bucks Lambeau Leap games?